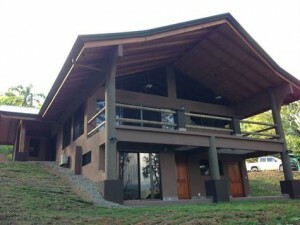 This eco friendly home was just built in Costa Rica and is located in the hills above Playa Dominical. The home is now for sale and is a great, affordable option for someone looking to live in paradise and be one with the environment. The builders took many things into consideration when they built this beautiful 3 bedroom home. They installed a solar hot water system, the house is ready to have solar panels installed, they planted 80 trees to offset the wood used in the construction, the house has energy efficient appliances, there is a rainwater catchment system in place, and many more eco friendly features. 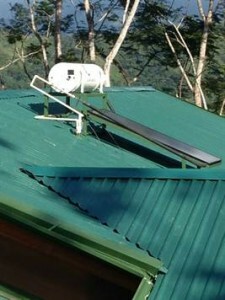 This is the best eco friendly home in Southern Costa Rica.The benefits of buying an eco friendly home are many. You can feel good that you have not had a bad impact on the environment, you will save money on your monthly electricity bills, and when you want to sell your home it will have more value! This home is located in Lagunas, 10 min from the beautiful beaches and the town of Dominical. Lagunas is a great place to live and has plenty of wildlife including birds, monkeys, sloths, etc etc. The mountain views from this home are spectacular. 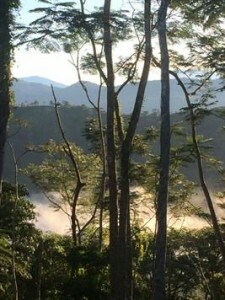 You can watch the sunrise over the biggest mountains in Costa Rica!!! This is a great place to enjoy vacations with your family or to make it your full time home. Many people buy homes in this area and then rent them as vacation rentals and you can make some really good money doing this, and still get to enjoy your home whenever you want. Posted in News, Uncategorized and tagged Eco-Friendly Costa Rica Homes, Southern Costa Rica. ← Great Deals for Investors!